Difference between revisions of "Caramel"
Caramel heals 1 hunger point and 0.5 heart. Caramel is a food item that can be used to craft the [[candy apple]]. Caramel is a tasty treat you can cook in a [[Furnace]] from [[Sugar]]. 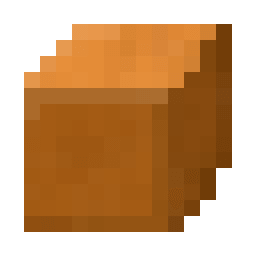 You can then use it raw as edible food, or you can craft it in a [[Crafting Table]] with an [[Apple]] and a [[Stick]] to obtain a [[Candy apple]]. Caramel is a tasty treat that can be obtained by melting [[sugar]] in a [[furnace]]. Caramel heals 1 hunger point and 0.5 heart when eaten. Caramel is used to craft a [[candy apple]]. Caramel is a food item that can be used to craft the candy apple. Caramel is a tasty treat that can be obtained by melting sugar in a furnace. Caramel is used to craft a candy apple.